The Evil Within hit stores this week, a survival horror title with a considerable pedigree. The game marks Shinji Mikami’s return to the genre, and the Hype Train expected a lot of Mr. Resident Evil’s new effort. One thing we were certainly counting on is one of his hallmarks: the chainsaw-brandishing nutbag. Well, fear not, because he remembered to pack one. Let’s buckle up and meet The Sadist. First, a little walk down head-lopping memory lane. 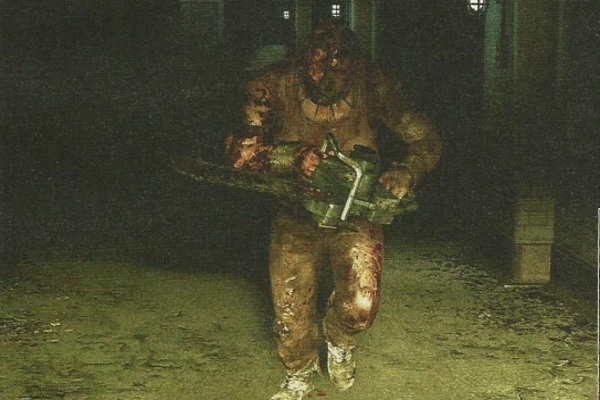 Fans will remember Resident Evil 4‘s own ‘Chainsaw Guy’ (or Dr. Salvador if you prefer). This enemy appeared very early in the game, during a tense setpiece in the village. He was much more resilient than the standard Ganados, shrugging off bullets like the Terminator, and would insta-kill you if he got within range. All of these fine attributes were shared with his female counterparts, the Bella Sisters, and The Evil Within’s Sadist is now part of that fine legacy of homicidal crazies. He also appears very early in the game, as a way of introducing the player to the stealth mechanics in the most pants-fouling manner possible. Sebastian is still unarmed at this point, as he cruises through a deeply creepy hospital-y building. The Sadist is patroling the area, and you must desperately elude him. First, you’ll be forced to hide in a locker, Solid Snake style, before learning how to negotiate the environment without being detected. The Evil Within utilises a stealthy trick or two of its own. There are wine bottles strewn about the areas (surprisingly many of them at that; your crazy mutant enemies must have a severe drink problem), which you can collect and throw. Whereupon, the lurking menaces will hurry off to investigate the noise. In another homage to later Resident Evils, he’ll appear again later in the game. With Sebastian now tooled up with deathly death-sticks of his own, you’re able to turn the tables and kill him. Indeed, you must, as his pet saw is the key to a puzzle. All in all, this guy is the primary antagonist of the early game, and serves wonderfully at establishing the unique oppressive mood of The Evil Within. Bonus points also for this guy’s design. He looks more intimidating and/or freaking hideous than Dr. Salvador ever did.